Motivated Seller Reduces Price - Property Must be Sold! This unique, low maintenance home presents arguably the best value opportunity in Everton Hills and the surrounding region. Little known however frequently utilised by locals, this property is genuinely walking distance to the Oxford Park train Station. Where else can you find such a stylish, completely renovated property with elevated city and district views within a short stroll to the trainline in this price range? Displaying a professional modern renovation, this beautiful brick home features a flowing and easy maintenance design that takes full advantage of its stunning district panorama. The stylish interior is enhanced by a well-planned split-level layout that includes a generous open plan living area, quality finishes and an easy flow to a private outdoor space for entertaining. This very appealing home is perched in a whisper-quiet hilltop position that captures fresh natural breezes and amazing views that stretch to the city skyline. It is immaculately presented throughout and features a generous formal lounge room with high raked ceilings and fireplace plus a bright open family room at the rear. There are three air-conditioned bedrooms that are each well proportioned, including a large master with a city-view balcony and a sparkling new ensuite bathroom. 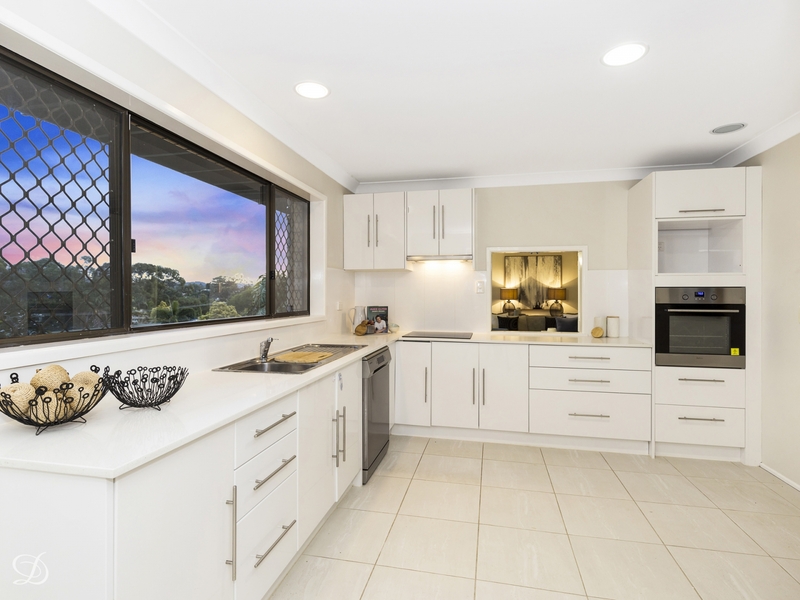 The kitchen is sleek and modern with its Caesarstone benchtops, designer fittings and a leafy outlook. A sunlit alfresco patio is perfect for BBQs and entertaining and enjoys an elevated aspect over the surrounding area. There are also low maintenance terraced gardens, a half tennis court located on the lower level of the property, and a double lock-up garage with mezzanine storage space. This relaxed family retreat also enjoys a top location that's strolling distance to schools, shops and Kedron Brook walking and cycling tracks, as well as Brookside Shopping Centre and a choice of nearby parklands. You'll relish the convenience of being able to walk across the suspension bridge to Oxford Park Train Station. Phone Haydn Denovan for more information or to arrange your private viewing.